One of the most important assets in our company is the people! EProjectConsult is an energetic company with young staff. You will always find here fresh trainees from elsewhere who constantly improve their skills and knowledge through different activities and courses organised by our team of experts. We have a great number of nationalities involved into our projects and all our employees speak several languages: Italian, Spanish, French, Polish and Japanese. They are bringing together not only their language skills, but also unique personal experiences, vision and cultural diversity. However, our working language remains to be English. EProjectConsult is led by Antonino Pietrini and Federica Sottile, the founders and owners of the company, and leading organizers of main projects. Both are true Italians, but thanks to their studies and international working experiences they can be considered as international citizens. During your cooperation with EProjectConsult you will be in touch with both of them, and they will help with any problems or difficulties which you might face. As it was already mentioned above, people is what makes EProjectConsult special; it is a reason why we are the top first organization for your project or training in Italy. Human value is present in every single project and running process of our organization, it is something what should never be underestimated, it is our strength! European Project Management of projects implemented according to regulations of European Union in the field of Culture, Youth Citizenship, Life Long Learning and Media. Coordination of International activity in the field of the Erasmus+ Programme as sending, hosting and coordinating partner. Consultancy services for private and public bodies for financing opportunities within different EU programs, procedures and knowledge needed for development of project proposals, as well as knowledge and best practices for management of EU projects, or application submitted at Regional, National and International level. European Project Management of projects implemented according to regulations of European Union in the field of Culture, Youth, Citizenship, Life Long Learning and Media. Coordination of International Youth Exchanges in the field of the Youth in Action Programme and Leonardo Da Vinci Programme as sending, hosting and coordinating partner. Consultancy services for private and public bodies for financing opportunities within different EU programs, procedures and knowledge needed for development of project proposals, as well as knowledge and best practices for management of EU projects, or draft submitted at Regional, National and International level. Coordination and project management of European Projects in Italy and abroad in the field of the Youth in Action Programme and Life Long Learning Programme. Fund raising, tender writing, project implementation and evaluation. Hi! My name is Linda, I am from Poland. I graduated Political Science with specialty of journalism . I work at EProjectConsult since January 2018 and I am in charge of coordinating and supporting European projects with Polish partners, building new partnerships with Polish institutions and project management activities in the frame of the Erasmus+ KA1 programme and Europe for citizens. I am experienced in management and Training Courses. I speak Polish English and French. I love travelling and discovering new cultures . I am passionate about sport especially running and canicross. His job consists in witting new project proposals, providing consultancy service for private and public bodies, supporting the back-office activities and building new partnership with foreign organisations. He also has experience in corporate finance industry, having worked for 3 years as Credit Analyst within the banking sector. Errol speaks English, French and Italian. Hi! my name is Serena, I am a native of Barcellona P.G and have been working at EProjectConsult since 2013. I’ve started as Office Manager and now, since 2016 I’ve joined the Communications department, as coordinator and graphic designer. Thus, I create graphics for marketing materials and campaigns (logos, flyers, brochures, etc…), I write contents for our online platforms, update website and social media channels of the company and develop digital marketing strategies. 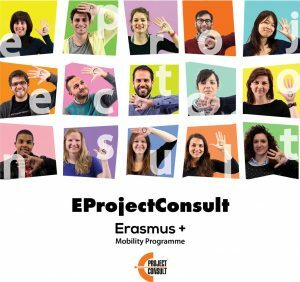 As office manager, I assist the project coordinators in implementing the Erasmus+ mobility projects and I am involved in a variety of administrative and logistical activities. As I’m passionate about photography, video editing and graphic design I’ve gained experience and valuable knowledge of the following software: Adobe Photoshop, Adobe Illustrator, Adobe InDesign, Final Cut, Edius. Hi, my name is Loris Saporita and I work as IT specialist at EProjectConsult. I have managed hardware, software networks and troubleshooting. I am responsible for all internet-related technical issues in the company in order to make sure the workflow go smoothly without any pause, then, provide good technical solutions in order to fix it. I am also a web master and web designer mainly in charge of setting up and designing the company’s website. For participants’ apartments, I guarantee internet connection and maintenance installed during their stay. Andrés Sanesteban López is Spanish, graduated in Information and Documentation. He is in charge of coordinating and supporting European projects with Spanish partners, building new partnerships with Spanish institutions and project management activities in the frame of the Erasmus+ KA1 program and Europe for citizens. He also assists the team preparing EU and/or international project’s proposals under the program Erasmus + Key Action 2 – Cooperation for Innovation and the Exchange of Good Practices in the field of education, training and youth. Managing the daily contact with clients and international stakeholders. Preparing all the support documents functional to the implementation of the projects in Sicily and Italy. Preparing EU and/or international project’s proposals. Contacting potential customers and organizing meeting and Seminar in Italy and in Europe. Hi, my name is Daniele Grasso and I work as an experienced driver at EProjectConsult. My duties are involving to offer safe and on-time transfer services for groups of max. 8 people, from the airports to Barcellona Pozzo di Gotto and vice versa, transport during study visits to different companies, and excursions to attractive places within Sicily. I worked as Interpreter or translator of japanese, Italian and English for many individuals and organizations. Significant knowledge and experience in Business, Manufacturing, culture and tourism. Now I work as public relations’ organizer and interpreter for the EProjectConsult Office, that is an International company which deals with EC project management and its operates as International consultantancy office for private and public bodies. We also coordinate the activities and the international projects of the “A Rocca ” that is Artistical Association and Tourist assistant Company. – Pottery, Photography, Make Up, Drawing and Painting Courses. We can also guarantee linguistic support in Italian, English, French, Spanish and Japanese. Graduated in engineering she was working most of the time in the tourism sector. She decided to studied Italian a couple of years ago and now she is working at EProjectConsult as Japanese Speaking Assistant since 2016. She assists in the management and organization of this International consultancy office for private and public bodies; and she also helps with the coordination of the activities and the international projects of “A Rocca ” that is an Artistical Association and Tourist assistant Company. Hi, my name is Ignazio Amore. I live in Catania and I have graduated in management and business administration at the catholic university of Milan. At EProjectConsult, I am responsible for developing services and business matters in the area of Catania. I will manage the welcoming of interns and participants of study visits and I will make sure that the overall experience in Catania will be seen as perfect. Hi, my name is Angelo Giallongo, I live in Catania and I’m graduated in International relations. I am in charge of finding the best internship opportunities and accommodation for our interns and guests in Catania. I will also take care of our students and interns, making sure that their stay and working period goes as smooth as silk. Hi, I am Giusy Grasso and I work as Logistic Support and Accomodation Standard at EProjectConsult. I am mainly responsible for cleaning, checking all the apartments and guarantee the hygiene and sanitation during participants’ stay. I have familiarized myself to use all cleaning materials and tools. I also support some assistance relating the apartments’ issues if any participant needs. provide assistance for what concerns the apartments.